As the scene opens, Buzz comes home from work and finds his oldest daughter, Charmeuse, is entertaining a visitor in the living room. when I tear my shirt open and smash things at recess. I just hate getting picked last for kickball. It make me so angry!" "This is my friend, Jimmy," Charmeuse tells her father, blushing and giggling. "He's in my class at school. We're... studying." "Mmm hmm," replies Buzz, who is trying to burn holes directly through Jimmy's head with his eyes. He leaves the room, but hopes their brief exchange has expressed his complete willingness to rip Jimmy's arms out of their sockets should it for some reason become necessary. 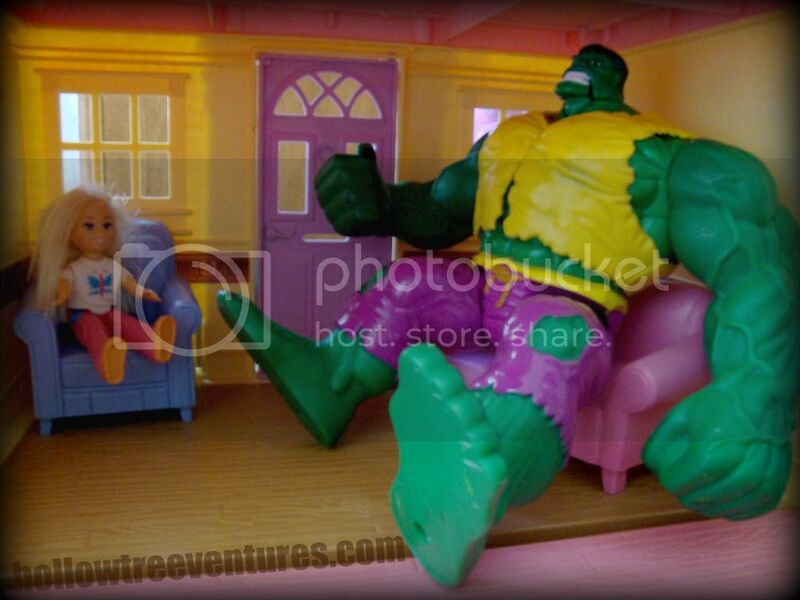 Later that night, Buzz asks Sunny why she would allow that boy in their house. "Oh Buzz, don't be ridiculous. He's the youngest of the Hulk boys. He's harmless." "He doesn't look harmless. Isn't he a little... developed for a fifth grader?" which is oddly low and makes useful furniture arrangement impossible. "You know kids today, with their Wheaties and free weights and anabolic steroids," Sunny says dismissively. She has a growing concern that this conversation will drag on until one of the kids gets out of bed to complain about monsters in their nonexistent closet before she has time to pour herself a glass of wine. "Things are different now from when we were their age," she calls over her shoulder, as she scurries to polish off the bottle she'd opened at lunch. "Well, I don't like it. Not one bit," Buzz says to no one in particular. The next day, Jimmy stops by again - but this time, Buzz is there to answer the bell. "Come in, m'boy," Buzz says warmly, ushering Jimmy's ample frame through the door using four sticks of butter, a bottle of canola oil, and a crowbar. He closes the door quietly in hopes Charmeuse hadn't seen her new beau ride up to the house on his Schwinn. "Thanks, Mr. Indenial. Golly, I'm glad to see you aren't mad at me. The last time I was here," he continues with a chuckle, "somehow I got the feeling you wanted to rip my arms off. Hahaha." "Riiiight," Buzz replies. "Look, Jimmy - I'd like it very much if you never spoke to my daughter ever again. You're both so young - you'll have plenty of time for this sort of thing later. Much, much later. Or never." Buzz climbs up on a chair and gives Jimmy a fatherly pat on the shoulder. Jimmy tries to put up a fight, but he's respectful of his elders. Besides, as a fifth grade boy he was dangerously close to getting cooties anyhow. With a final shrug, he lets Buzz guide him toward the door. Cut to a close up on Charmeuse, who has been hovering over them on the invisible staircase landing. As Jimmy leaves, tears well up in her eyes. "You never loved me! You've ruined my life FOREVER," she screams at her father before stomping to her room, slamming the door, and throwing herself dramatically onto the bed. and blahblahblah," Charmeuse sobs, being totally rational. Several days pass, and Buzz foolishly thinks that his fatherly concerns and preferences have had any impact whatsoever on the situation. However, as he drives by the ice cream parlor one afternoon, he sees Jimmy buying his daughter a cone. I'll have ALL THE THINGS!!!!!" Instead of erupting in a volcano of parental hellfire, however, Buzz decides to play it cool. He doesn't trouble Sunny with his discovery, nor does he lecture Charmeuse. Instead, he invites Jimmy to go for a drive so they can chat - man to man. Once they're a considerable distance into the rural countryside, Buzz pulls over in a wooded area to get a few things from the back of the minivan. "Jimmy, you're a strapping young lad. Would you help me with this sack of shovels?" Jimmy obediently hauls the sack out of the car, as rolls of duct tape and a few Tasers spill over the top. "It sure is nice to get out and stretch my legs, Mr. Indenial. I think I might be a little big for your car." "Not to worry, Jimmy," Buzz reassures him. "It might be cramped now, but it'll be much roomier on the way home." Everything goes exactly according to Buzz's plan, and Jimmy stops coming around to see Charmeuse. Buzz congratulates himself on some top-notch fathering one morning over a bowl of cereal, but nearly chokes when he takes a closer look at his carton of milk. 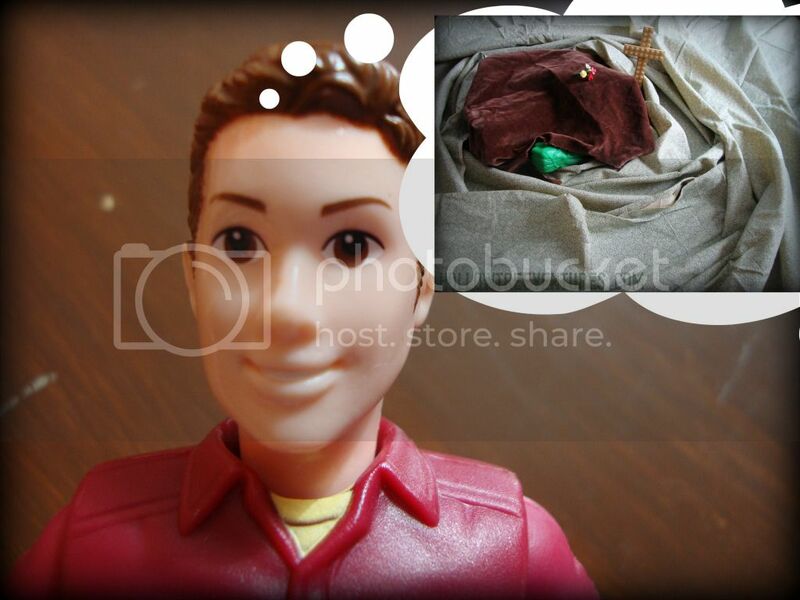 Buzz tries not to panic, but a thousand questions rush through his mind. Did anyone know about the little drive he'd taken with Jimmy? Had Charmeuse seen the milk carton yet? Was he sure he'd shredded all those receipts from the Discount Chloroform Outlet? Why was his wife suddenly buying him so many boxes of Wheaties? "In retrospect, maybe I shouldn't have marked the grave..."
Buzz knows he has to talk to his daughter, but he must address the subject very cautiously. He calls her downstairs. "Honey," Buzz begins, "You've probably don't know this, but Jimmy, um... ran away from home." Charmeuse nods. "Yeah, I heard at school." "Oh. So I'm guessing you also know that they'll probably never find his body." "Um, I said he'll probably never come home. Anyway, I was just afraid you'd be upset, and also wanted to know if you felt like I've been acting suspicious lately, or if you remember hearing me come home late a few nights ago, hose a bunch of things off in the driveway, and then burn my clothes in a barrel." "Oh Daddy, I'm fine. That day when Jimmy took me out for ice cream, I realized I could never be with someone who wears clothing that's all tattered like that. So tacky! Jimmy and I broke up weeks ago." "I'm going to need some of your mother's wine." One click below is all it takes to vote for Hollow Tree Ventures (and the drama of As The Dollhouse Turns) on Top Mommy Blogs! Then click here to view all the dramatic episodes - it's like your own innerwebs DVR. No father of a teenage girl can have too many shovels or too much duct tape! At one point in my life I might have considered that a tad overprotective, but that was before I realized I'm going to need to install razor wire over Zoe's window in the next few years. Agreed! And that's to say nothing of the crushed-up NoDoze I sprinkle on their oatmeal every morning to enhance their ability to focus at school. That is a turn I did not expect the dollhouse to take! I don't know what I like better, your story or your snarky comments about the dollhouses inadequacies. The placement of the windows DO make rational furniture placement impossible. 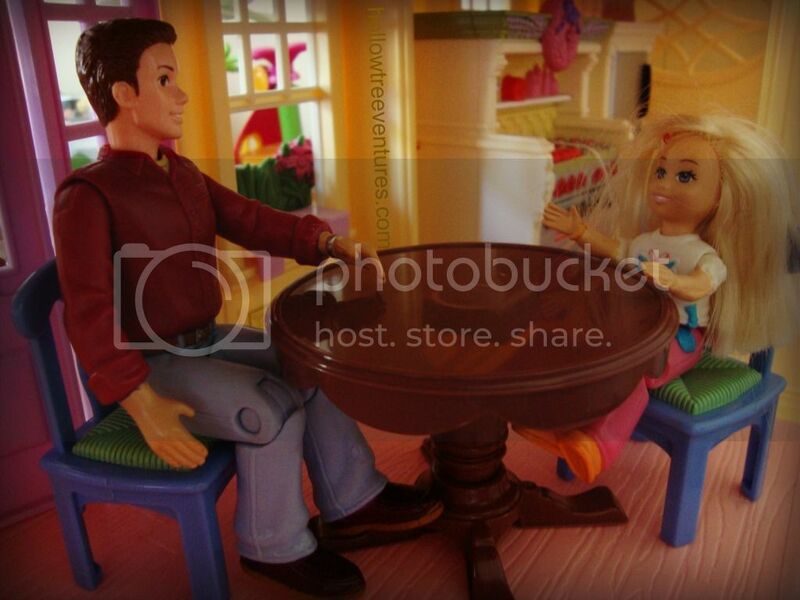 I tell Ball that's why I can't play with her doll house. The windows drive me nuts - but of course little kids don't care. They'll cram a hutch in front of a window or put a bed right where it blocks a door. No sense of style, these kids. A), I think you are watching too much daytime drama. 2) I have the SAME PROBLEM with the windows in my house...WTH? Finally, I already have a big stick to beat the girls off my sons. I don't think I could STAND it if I had daughters. I know what *I* was like! I'm in denial that my girls will ever grow up. Nice touch with the milk carton! I had a classmate in teh 7th grade that looked just like Hulk J. Hulk. A dad has to do what a dad has to do. Not a jury in the world would convict him. Okay, they would, but secretly they'd sympathize. This could be the screen play for Avengers 2. Plus my browser was perfectly aligned so that I read the opening line and then had to scroll to see the picture. 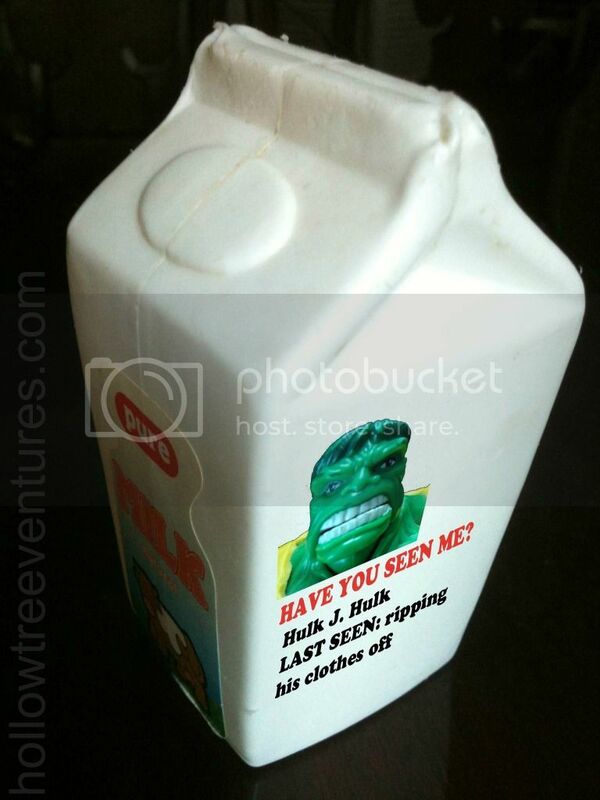 When I saw the Hulk I almost spit out the non-existent beverage that wasn't in my mouth. This might be the first Phantom Spit-Take I've ever elicited, so that's going on my resume for sure. Same goes at my house - with all their brothers and my husband, my girls' dates will probably never make it onto the porch! I'm right with The Meaning of Me. I read the title, opened the email and cracked up immediately at the picture of Hulk trying to comfortably lounge in that chair. Absolutely hilarious! Great saga...with all the darkness of a real soap opera. The conversation with his daughter at the end cracked me up too. Very funny! Love your posts! So glad I discovered this. Am just about to cancel our cable TV and was worried I wouldn't have a replacement for my reality TV/trashy drama fix. Problem solved. 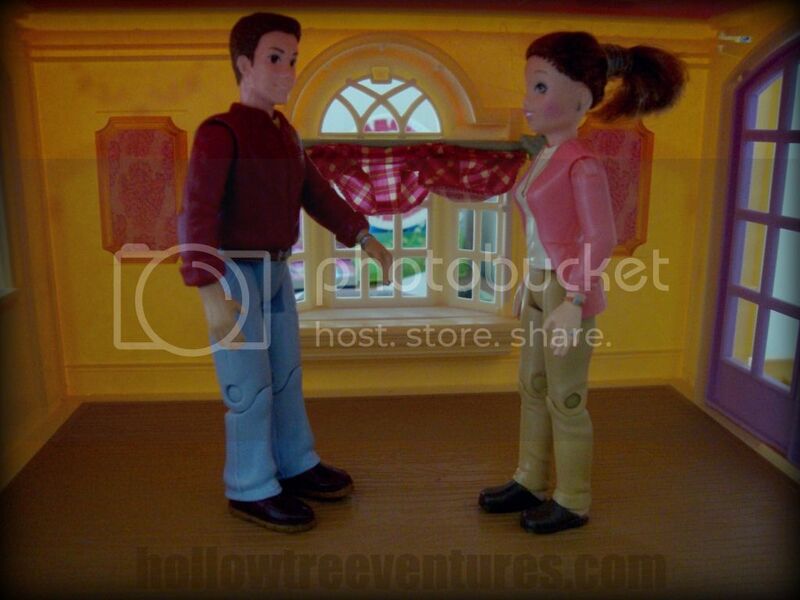 Also couldn't agree more on the frustration of dollhouse window placement. Especially when you are already dealing with the challenge of only 3 walls. Sheesh. Don't tell my TV, but we're thinking about canceling cable, too. Actually, don't tell my husband, either - I'm not sure I've mentioned it to him. 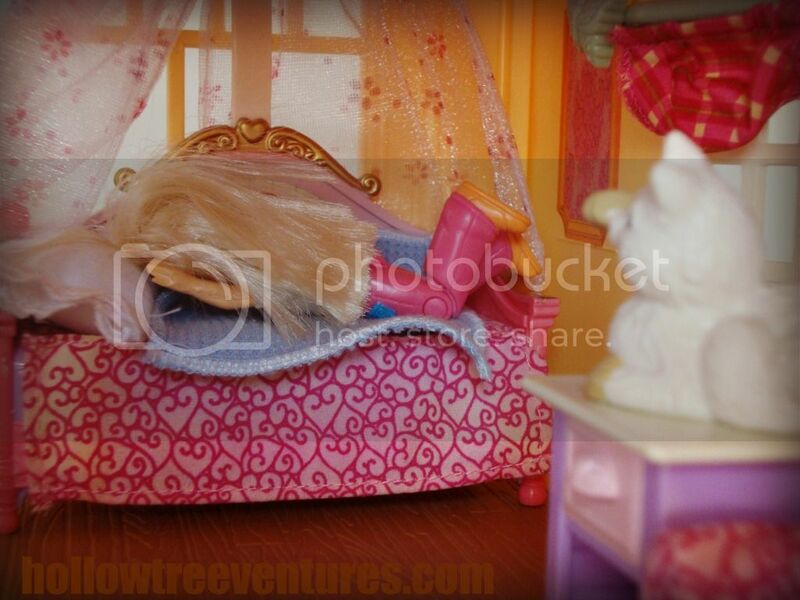 And the dollhouse set up is messed up; three balconies but no bathrooms? No way. These stories kill me! I look forward to them every week! Yay - thanks for the encouragement! This saga needs to be a book. I'd buy it. And laugh every day. First timer with the ATDT series. And I'll be back for more. My favorite part? Dad standing on a chair to give Boyfriend a fatherly pat on the shoulder. Great visual. Hysterical! I too found the first image funny when I clicked on it! 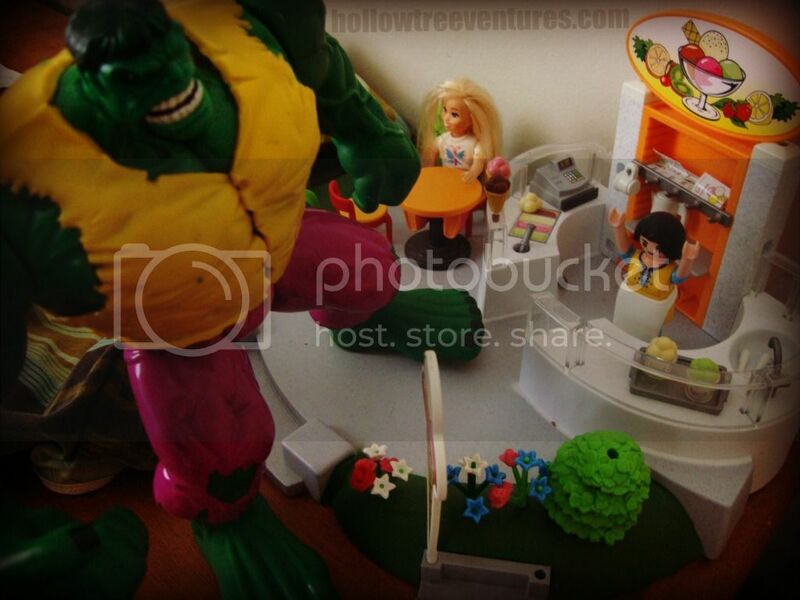 I am happy you found the big hulk first too! Also, I snorted out loud at the caption at the ice cream shop "....I will have ALL THE THINGS!" LOL, great stuff! Cant wait for more! Did you have a career in film production before this? 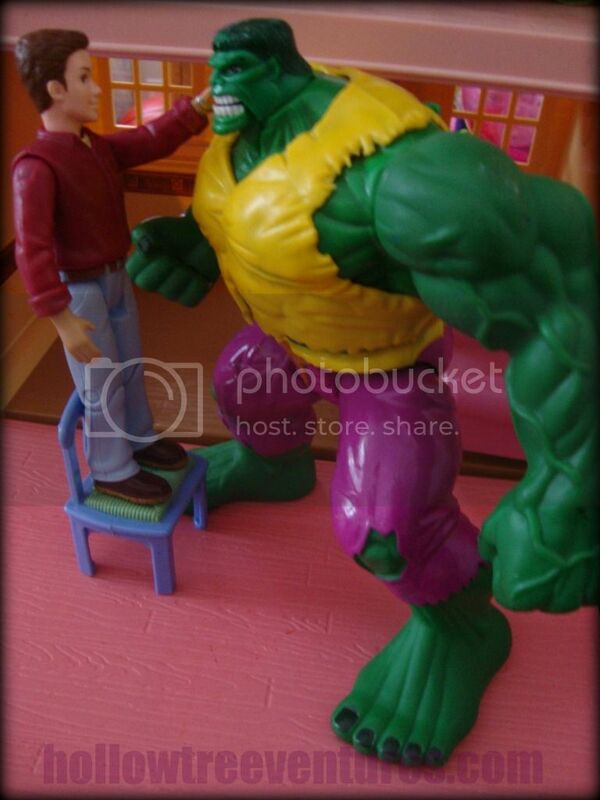 LOVED "you know kids these days w/ their anabolic steroids" & how the dad climbs up on the chair to give hulk a fatherly pat & when the dad questioned the daughter if she noticed anything strange the other night when he came home late & set his clothes ablaze. Good stuff. Can't wait for the next episode, but this is turning into more of a soap opera meets the Sopranos. All you have to do (from the soap opera perspective) is have the Hulk come back from the dead. See, the father never really killed him. He thought he did, but Hulk wasn't really dead so he digs himself out of the dirt grave & reappears on the middle school scene. G. E. N. I. U. S. It's a good thing my laziness kicked in (as if it ever kicked out), preventing me from taking Hulk to the Goodwill like I was supposed to. Hulk, get ready for your close up! This is HILARIOUS--you are my hero! Not in the Hulk kind of way...more in the David E. Kelley, Chuck Lorre, or Jerry Bruckheimer kind of way. T.A.L.E.N.T.E.D. Thanks for the laughs! It scares me how big my kids are getting - when strangers ask their ages and then, wide-eyed, exclaim, "Oh, they're so TALL," I smile politely but inside my head I'm screaming, "THEY'RE MY TINY BABIES SHUT UP!!!!!" Thanks so much for reading - I'll be sure to let you know when I'm offered a book deal (HINT, HINT, publishing industry).